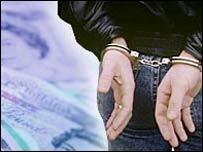 More than £3m has been taken out of the hands of Northern Ireland's organised criminals by the Assets Recovery Agency in its first year in operation. The police and customs services referred 27 cases to the agency, resulting in 19 live investigations with combined assets in excess of £8 million. More than 100 court orders were obtained, allowing it to carry out searches, examine bank accounts and solicitors' records. 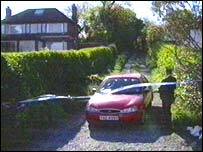 The biggest operation carried out involved property belonging to leading loyalist Jim Johnston who was shot dead in County Down last year. The agency said it had worked closely with the Criminal Assets Bureau in the Republic of Ireland. The agency published its annual report and 2004-05 business plan on Thursday. Director Jane Earl said: "We have made enormous strides over the past year to create a new organisation, capable of responding to the challenges of contributing to crime reduction through asset recovery. "We have learnt a great deal about the processes of investigating and litigating cases using POCA (Proceeds of Crime Act). "Because of the proper legal safeguards enshrined in the act, we now know that our cases will take approximately two years to bring to a conclusion." The agency exceeded its 2003-04 targets of the number of cases under investigation by 24%. Ms Earl said the agency was "enormously encouraged by the support of the public for asset recovery". "Research undertaken by YouGov Ltd and by the Northern Ireland Office showed that 84% of those surveyed support our powers to act through the civil courts." However, South Antrim Ulster Unionist MP David Burnside said the amount recovered was "peanuts" compared with "the vast criminal empires that exist within both the republican movement and loyalist paramilitary movement". "Drugs, extortion, petrol, diesel - you name it, it is there. Let's raise the targets," he said. "The target should not be £3m, £5m, £10m a year - it should be £30m, £50m, £100m a year and then the Assets Recovery Agency will deserve great praise and they will get it from politicians like myself."